here’s a reason, Paul Welles, says, that that it’s called the Green’s Creek Challenge. 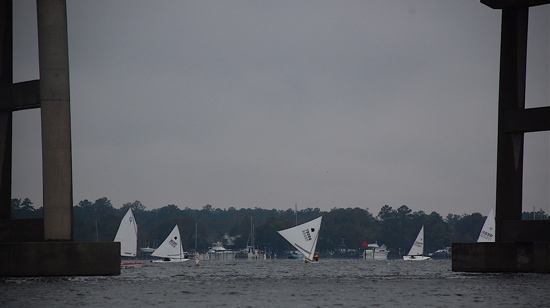 Ron Medlin and his Laser head toward the bridge while a school of Sunfish round their mark in Saturday’s Green’s Creek Challenge. Welles, who’s organized the race in recent years, notes that you sail down not just one, but two creeks. What’s more, he told this year’s competitors Saturday, just when you think you’ve got it won, you go “down a hole, ten feet from victory,” and other boats pass you by. View from under the bridge of this year’s Green’s Creek Challenge. It was a monochromatic day, where a sail, PFD or nav marker provided the occasional burst of color. This year’s Green’s Creek Challenge had an additional challenge: rain. It rained Saturday morning, during the first race. It continued through lunch. And there was a drizzle in the afternoon for the final race of the day. A small craft advisory was in play for the Sound in the afternoon. Still, the race went on. Eighteen boats and sailors toughed it out. 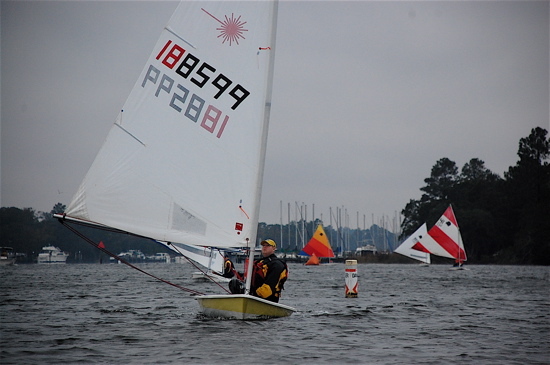 There were 7 Sunfish, 5 Lasers, 3 Optimists and 3 boats competing in the Challenger Open Class. Paul Bogardus, winner of the Challenger prize, for boats not competing within a class. Paul points out his sail has seen a lot of action, and patches. 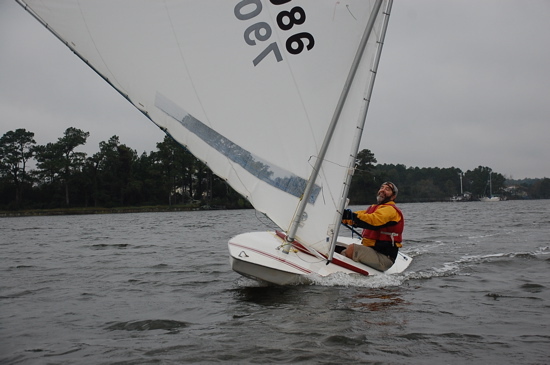 Rob Eberle won the Sunfish Class. The rain and dreary cold did reduce the ranks a bit and kept away some who would’ve sailed if it weren’t so wet. (Said one would-have-been sailor: “I didn’t leave England years ago, to sail on days like this.”) Some of those who competed in the morning race opted to sit out the afternoon one, rather than get another set of clothing — and themselves — soaking wet and cold. Rain, what rain? Ken King came in first in the Laser class. 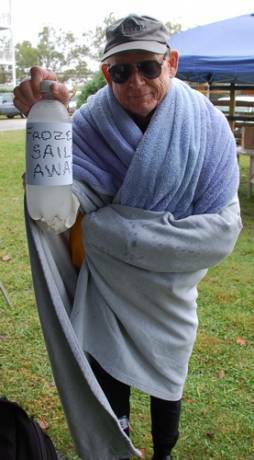 For being soaked straight thru, he also snared the Frozen Sailor Award. Ben Bruno, the youngest of this year’s competitors. 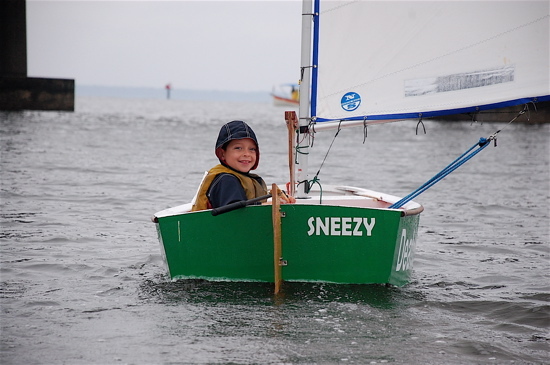 He competed in the Optimist class and took 2nd place behind Nicole Edwards. The event, a long-running tradition in Oriental and a celebration of boats 20 feet and under, was sponsored by Triton Yachts, Inner Banks Sails, Laser Performance and the Inland Waterway Provision Company. The post-race ceremony took place under a picnic tent in Grace Evans’ backyard. 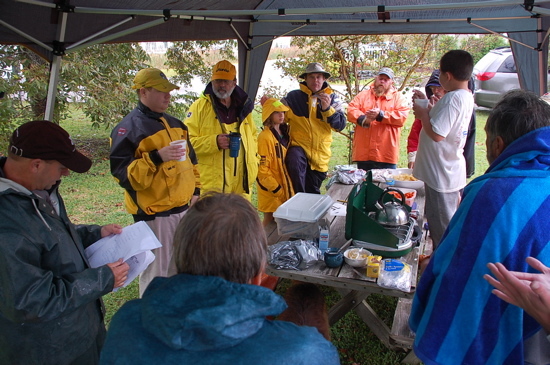 The focal point was a Coleman stove which heated water for tea and hot cocoa while Greens Creek Challenge maestro Paul Welles handed out the awards. Paul and Nancy Welles were the chief organizers of the race. 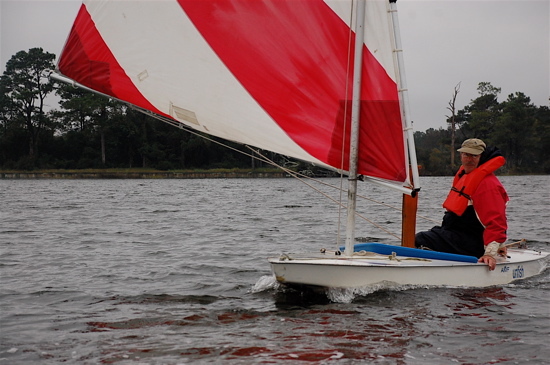 Paul Olsen and Jim Edwards manned the chase boats, while the Oriental Dinghy Club provided the Race Committee boat. Marilyn Sechrist assisted with lunch. 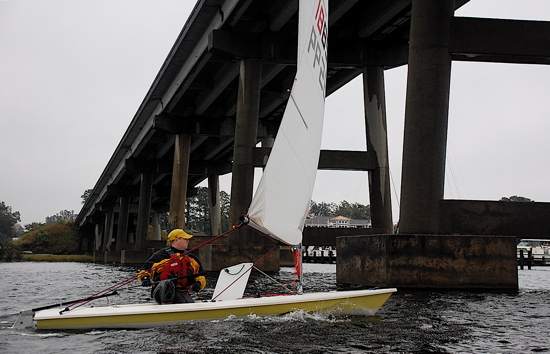 One challenge of the Greens Creek Challenge is sailing under the bridge.